To commemorate the one hundredth anniversary of the inauguration of George Washington as first President of the United States. N, 73° 59.826′ W. Marker is in Manhattan, New York, in New York County. 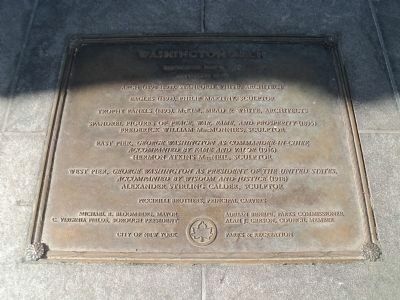 Marker is at the intersection of Washington Square N and 5th Avenue, on the left when traveling west on Washington Square N. Touch for map. 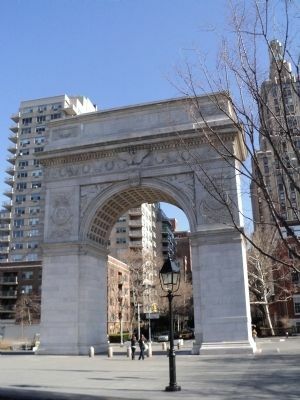 Marker is located at the 5th Avenue entrance to Washington Square Park. 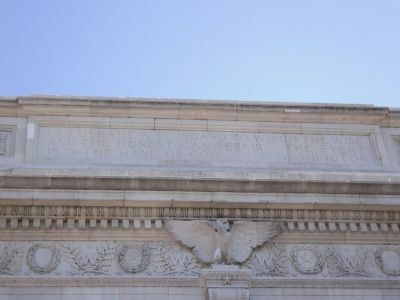 Marker is in this post office area: New York NY 10012, United States of America. Touch for directions. Other nearby markers. At least 8 other markers are within walking distance of this marker. Bella Abzug (about 300 feet away, measured in a direct line); Cervantes (about 300 feet away); Edward I. Koch (about 300 feet away); Alexander Lyman Holley (about 300 feet away); Edward Hopper (about 400 feet away); No. 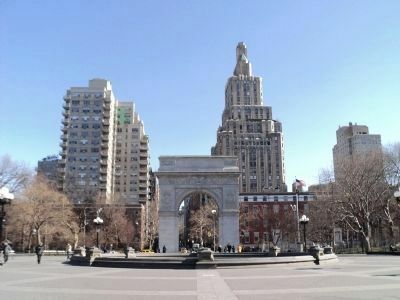 22 Washington Square North (about 400 feet away); Birthplace of Galo Plaza Lasso (about 500 feet away); Judson Memorial Church (about 500 feet away). Touch for a list and map of all markers in Manhattan. 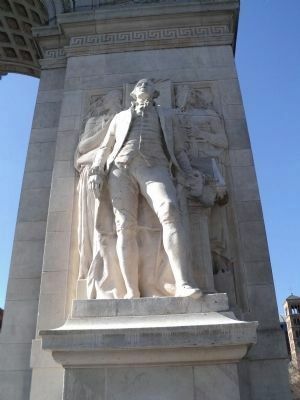 George Washington is depicted here as Commander-in-Chief and is accompanied by Fame and Valor. This statue is made of marble and stands 16 feet high. 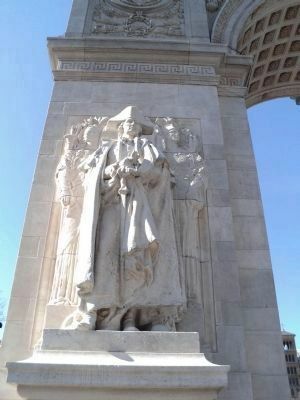 This statue shows George Washington as President of the United States and he is accompanied by Wisdom and Justice. 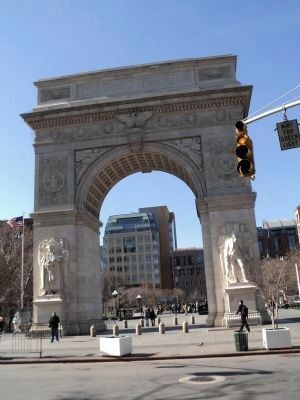 This photo of the Washington Arch was taken from inside Washington Square Park. The central fountain can be seen in the foreground. More. 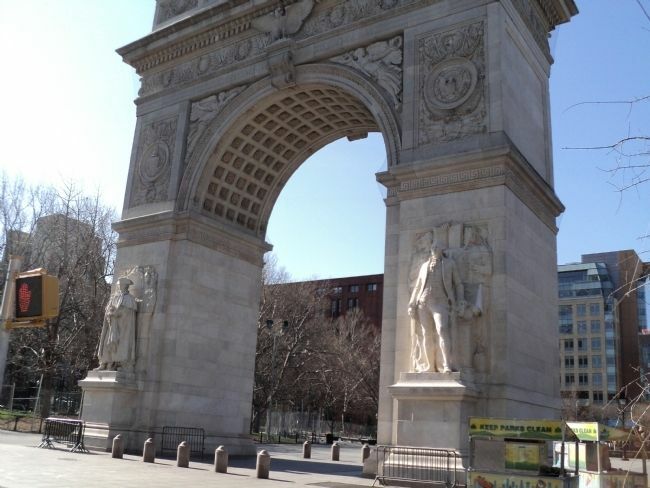 Search the internet for Washington Arch. Credits. This page was last revised on February 1, 2018. This page originally submitted on March 31, 2011, by Bill Coughlin of North Arlington, New Jersey. This page has been viewed 479 times since then and 7 times this year. Photos: 1, 2, 3, 4, 5, 6, 7, 8. submitted on March 31, 2011, by Bill Coughlin of North Arlington, New Jersey.